This past Tuesday, Shubert was proud to lead a presentation at the League’s Spring Road Conference. Titled “Radical Hospitality: Technology Solutions for Audience Inclusivity,” the session focused on new initiatives that are making Broadway more accessible for everyone both in New York City, and soon on the Road. There are currently 56.7M people in the U.S. living with some type of disability— 19% of the population. It’s also accepted that 35% of people over 65 have some kind of hearing loss, which equates to almost 600,000 Shubert audience members each year who could benefit from closed captioning or assistive listening. 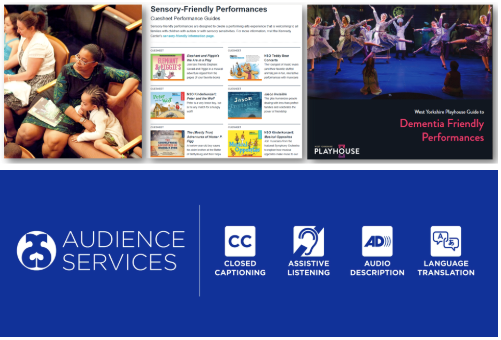 Kyle Wright, Digital Projects Director at Shubert, shared an update on Shubert Audience Services, which now offers on-demand closed captioning, assistive listening, audio descriptions, and language translations at every theatre through the free GalaPro app. As of June 1, all shows on Broadway will offer some sort of on-demand access services.